With Windows Explorer, you’ll not be able to perform advanced tasks like updating the album cover, batch renaming the files, creating a playlist from your selection, etc. 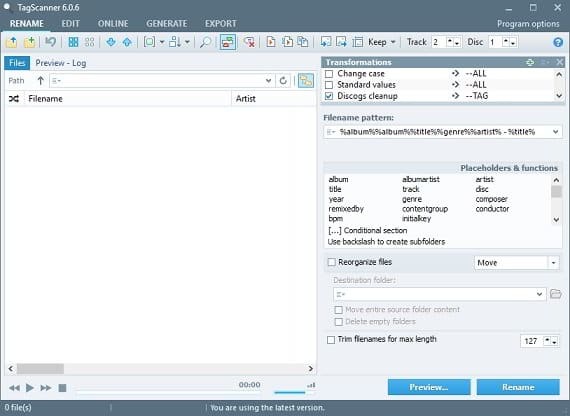 For managing your songs library, you should use a third-party program. One of the best music manager and organizer freeware for Windows is Tag scanner. The program has the features that I’ve mentioned in the above paragraph. It runs well on 32 bits, 64 bits Windows OS running computers. As a portable version of Tag scanner is available for download, you run this tool from an external USB drive. The track, album artist, Year, Genre, Composer. Disk, remixed by, BPM, Key. Size, bit rate, channels, sample rate. The toolbar of this freeware has a lot of options. You’ll have to hover your mouse over the icons one by one to know what the option will do when you select it. Tag scanner allows you to save a playlist from the selected files or entire music collection. The user can export a playlist to excel, CSV, HTML, m3u, text and XML file. To use this feature, the user should navigate to the export section of the program. Unicode formats are supported by this freeware. The program lets you download album cover for all types of music files. To do so, connect your PC to the internet, click on the online option from the menu and select a service from the right sidebar. Tag scanner supports 5 services – Amazon, FreeDB, TrackType, Discogs, and MusicBrainz. Once you select the service, enter the name of the song in the text box or click on the song from the collection. To the right of the textbox, you’ll find a right arrow button. Click it and the Tag Scanner program will connect to the service to get the album cover. It will also get the song details. If the file has an invalid or incorrect name, you can change it to the right one. The program may ask you for the authorization code when it tries to connect to the service. To get the code, you’ll be asked to create an account on the official website of the selected service. From the program options, you can specify a size for the album cover. You can also change its quality by changing the default value (70%). TS has options to play, pause or stop the playback of a song. These controls would be handy if the song file’s name is confusing. Tag scanner has a batch rename tool. You can translate the names to other language or change its case. This freeware lets users edit metadata aka tag containers (ID3V1, IDV32) of all supported files. It has a function to trim the file names. Before running the bulk rename module, make sure that you create a backup of your song collection so that if you’re not satisfied with the result, you can safely restore your files. You are allowed to move selected files to some other folder. You can change file name patterns easily in Tag Scanner. My Verdict: The 3 main functions of this program are batch renaming/editing sound files and generating a playlist. These three features work very well. TS has easy to understand functions which make organizing and managing music files an easy thing to do. Because of the limited support for international languages, users from non-English speaking countries might not like the program. Tag Scanner is one of top music organizer and management tools for Windows PC. TS makes the complex task of managing songs collecting and editing their metadata effortless. It's is a simple program that works with many types of files.